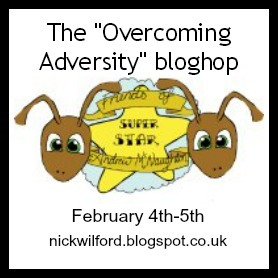 We're holding off on tropes today to bring you something special - Nick Wilford's "Overcoming Adversity" Bloghop, in an effort to create an anthology for his stepson, Andrew, who is dealing with cerebral Palsy. Funds will be used to support his college education. I'd first like to say how proud I am of Andrew. It is very easy to let life get you down, but it is also easy to forget that others are dealing with things that you could never imagine, or even wish on your worst enemy. That's not what this bloghop is about, though. It's about staring adversity in the eye and telling it, "no sirree! I choose my own destiny. I weave my own fate. This slice of life is delicious!" I salute Andrew and wish him the best life this world has to offer. Adversity; it can take many forms - thrown at you from left field or self-imposed, intentionally or not. The greatest struggle in my life hasn't been my health or my body, but my ability to communicate and socialize. Over the years I think I've improved in some areas, but every now and then, I might say something that will set people off when that was the farthest thing from my mind. This has led to unwarranted accusations and a revelation of another's interpretation of me - what I "believe," what my motives are, and so forth. Truth is, I'm such a laidback and easy going personality that I don't think such things about people. I have better things to do. Sure, I can always assume things and develop prejudice, but stewing over baseless thoughts does me and no one else any good. And so I ask questions, to help me understand people better. Once in a great while, those questions backfire. Badly. It was much worse when I was younger. Some have even accused me of having a mental disorder. I haven't been officially diagnosed with anything, but you know what? It wouldn't surprise me if I had something not quite all right upstairs, that something about me isn't "normal" - and if I did, I would make the best of it, make amends, and learn from it. What else can I do? But then there are those who, for whatever reason, saw past all that. Through their unique perspective, they were able to point things out about me and, without really trying, helped me in ways that will stick with me for the rest of my life. I'll tell you a story. When I was nine, I didn't have many friends in my neighborhood (very few families with kids my age in the area), but then a family moved in with a boy my age. Finally! A playmate! We got along great, right off the bat (come to think of it, we never did play baseball). One day, we played Monopoly. I was losing. I remembered seeing something in a movie where a character tossed the board and scattered the pieces everywhere. I don't know why I thought it was a good idea at the time, but I did that. My friend stared at me. Right away, I started to think about what he might be thinking. Was he about to leave and go home? Would he yell at me? Call me names? Were we about to throw punches? None of that happened. Instead, he looked right at me and said something that I will never forget - "Dude ... that wasn't cool." Nothing baseless. Nothing rude. It was just the truth. Without a word, he picked up the pieces and put the game away. I haven't done anything like that since, and I have one of my best friends to thank for that. I have done other things, of course, but when people are willing to take the time to understand rather than attack, that makes all the difference in the world. That's how people change for the better. That's how adversity changes into relief. As an open letter, I apologize for anything I have said or done to make anyone think ill of me. My door is always open to perspectives. I may need more coaching than others, but I will figure things out. My journey continues, where I enjoy helping people when I can and if I know how (or don't, or think I know). This is an adversity that has stalked me all my life and it may take a lifetime before it goes away forever, but it is love and friendship that has shaped me for the better - and it is my hope that that love will never vanish. Thank you for hosting this hop, Nick! I hope the anthology you are compiling will find many readers and that Andrew will have the means to make his dreams come true. You guys are my heroes! I'm David, and if we play Monopoly, can I be the shoe? Someone who just accepted you and still be honest in a tactful way - we all hope for friends like that. Very inspirational post. :) Also, I think I might start saying "This slice of life is delicious!" every morning when I wake up. Lol. A friend is someone who tells you like it is :) And who hasn't done something they eventually regret? The key is to remember, accept, and learn from it - which you are doing! I threw a chess board once for the same reason. (hangs head). David, I was thinking as I read this post, that I love how you are so candid and honest and vulnerable with your words. This is a quality I'm working on in my own writing. I think it's what draws people to our writing and adds depth to our words and thoughts. Wonderful post. Beautiful post, David. I think as children, we've all done things that we regret. It's part of growing up and learning that some things (as your friend might say) are "not cool." You seem to me to have grown into a wise man. We all need friends like that. I hope I am a friend to others like that. We all have our struggles and having someone who understands and forgives despite our shortcomings is priceless. That was a great post, David. Kids can be really terrible to each other, and I'm so glad that you had a friend who could just give you the honest truth. I hope people don't misinterpret my words or meaning, but it is just part of life. Great post, man. Monopoly has a way of bringing out the worst in some of us sometimes. It's the greedy little capitalist inside of us! Boys are pretty forgiving, aren't they? We can get into a physical fight, yet play basketball together 5 minutes later. Too bad many of us outgrow that as we age. If there's something not right with you it's not right with me either. Though, if it's ok with you, I'm totally going to start saying "this slice of life is delicious". When I was in college, not 9 or 10, in college, I had a friend flip our gaming table over on us because he was losing at Risk. I never found all the pieces. That's what makes accepting people so special. They're the ones who know we're all flawed and just don't care. They'll never be you, and you'll never be them. And that IS cool. Great story, David. You're living life the best way you know how, and that's really all that anyone can ask for. A great post! Adversity is one of the hardest things to overcome, I think, and it certainly isn't easy to understand people. I too have always had a hard time putting what I think into words that really make sense, but I guess that it's something you grow more into as you go. Best of luck to Andrew! Thanks for sharing your inspirational story, David. Sounds like you found an awesome friend - those are few and far between. I felt some affinity with this post because I have a tendency to misread social situations to the point where my wife says I'm lucky I haven't been punched! Very hard to define what is "normal" anyway. It would be a better world if more people were accepting rather than judgemental. Thanks very much for taking part in the hop. Great post, David. I can totally relate. Inspirational story David. True friends accept us for who we are without judgement and with respect for our human failings. We all have them after all. I'll play monopoly can I be the dog! Great post, David. None of us are perfect and part of being a good friend is to accept those things in each other. And we all have to work on those things we aren't perfect in. Sounds like you are doing just that. You can be the shoe anytime. I like being the dog but my kids have so many different monopoly versions we could do the Star Wars version, Pokeman, Penn State and I don't know how many others. Awesome post! They say that people are put in our life for a reason - either to change us or for us to change them. Those are the people I'm thankful for. :) Way to overcome adversity. And best wishes to Andrew, too. Love this. And DPK, I think you are one of the most laid back guys I've ever met. So easy going and easy to get along with. Definitely nothing wrong upstairs. You might just learn different. I do similar things so maybe it's something to do with a writers brain. Who knows! A great friend tells it like it is. An important lesson to learn. :) Love your honesty! Great post. It seems like a lot of ill will could be avoided if people would just open up to one another and honestly share what's on their mind. Just so you know I don't think people would call me "normal" either! And here I thought I was the only one who was not "normal". Now I think I'm very normal among all of you guys. Hahaha. In this blogworld, we're a group of uncommon normality. Nice entry. It'a amazing what patience and understanding can accomplish. We can all learn from this wonderful story which goes beyond friendship. Thanks David! Hi David, I'm Ella~ This was a wonderful, insight view into learning about each other! I so admire how you did this and all that you shared~ We are all unique and I think sometimes others forget that! It's wonderful to see how far people have come, and what great friendships have been born. That's a good friend there. Thanks for sharing your story with us. Thanks for sharing this story --- restores my faith in friendships. There's something really amazing about someone who can look at a situation and simply understand. I hope I am that sort of person and that I can keep myself surrounded by people like that. Cool story and bloghop. Is it sad that I've only ever played Junior Monopoly? I think everyone's done stuff when they were younger that they'd look back on and think, I did that?! But that's part of what it means to grow. We live and we learn. I'm with you, David. I don't have time to get into that stuff. I've got a neighbor, bless her heart, who seems to get wind of things people say about her and/or her family and it eats her alive. I never heard what my neighbors think of me. And that's okay. I saw something on FB that said it all for me. "What people think of you is none of your business." I really don't want to know if you don't like or approve of me. I used to be really concerned about what people thought of me. To some degree I still am, but only for important issues like a job interview. If someone doesn't like me...well it's their loss, right? an awkward moment & he handled it well to both of your advantages. thats a happy ending! i have pissed off many people and many times unintentionally... i have a strong personality & sometimes say things w/o thinking, but i've been accused of not being friendly when i dont say anything. feels like i cant win sometimes! I completely relate to not feeling "normal". I know I've gotten plenty of strange looks from people based on things I've said . . . Okay. This was, by far, one of my very favorite posts in this bloghop. My husband has had this same "problem." If that's what you want to call it. He can be blunt and honest to a fault and sometimes he says stuff that has even me looking at him sideways. But, honestly, his "fault" is, for the most part, one of my favorite things about him. Like me, he isn't "normal." He has a unique perspective of the world and, even if he says things that are socially inappropriate, they're always also true. LOVED the Monopoly story. Hilarious. Wtf are we thinking as kids??? And the "Dude. That was not cool." is the best response ever. So glad I got the chance to read this and learn more about you. Great addition to the bloghop! The iron was always my favorite piece, and I heard rumors that's the one they are retiring! Thanks for your honesty and openness here, David. The world really does need more people like you!